How many readers of this online newspaper, the content of which changes by the minute and which largely focuses on current events, will have the time or inclination to read Peter Adamson’s "History of Philosophy Without Any Gaps" (as his sub-title has it) that covers the period from after Plato and Aristotle to the death of St. Augustine? Probably not many, despite the fact that it’s clearly written, sprinkled with cute allusions to our day as well as with groan-inducing puns—yet also full of clear summaries of the main points of thinkers who once were household names. Read a history of philosophy? Most of us have too many other concerns, with rents or mortgages, maybe kids to get to school (or their tuition to be paid), deadlines to meet, dry-cleaning to pick up. Philosophy, it seems, is just too abstract to matter. Yet sometimes even practical people ask the questions that these philosophers pose. What’s the point of it all? Should I give up the rat race for the beach? Should I try and ratchet back my desires and move into a tiny house? Is income equality a given or a bad thing? Is there something beyond the here and now? What, in short, is the relationship between the things in our immediate world and the Big Picture—if there is a Big Picture? These questions—about the relationship between wealth and happiness, the self and the political circus, what we have and what we imagine—are precisely the main subject matter of this philosophical world sandwiched between the abstrusities of Classical Greece and the religiosity of the Christian Middle Ages. This world, through which Adamson leads such a spirited march, is our world, its problems our problems, and perhaps its solutions our solutions. Who are the biggest names here? For most of us, these are the Roman Emperor Marcus Aurelius, a Stoic, and St. Augustine, a Christian bishop. Perhaps we also know the major bridge between them, Plotinus. These rise above the smaller hills of other thinkers like mountains—not least of all because educated people today have heard of them. But even the fact that some thinkers are forgotten is part of the story here, and relevant to the question, what is the relation between the here-and-now and the theoretical, the real vs. the ideal? In this world, practicality hovers over all. Some of Adamson’s most interesting points involve the fact that certain thinkers have survived, and others haven’t—and thus that even what we take to be history seems determined by chance. Or is it fate? One chapter starts with an evocation of the eruption of Vesuvius to make the point that it preserved a copy of the most elegant expression of Epicurean philosophy, Lucretius’s On the Nature of Things. No eruption? No book for us to read, and intellectual history is altered. Many readers find Lucretius to be strikingly modern, with his insistence that everything that exists is composed of atoms floating in a void. Such ideas may be timeless but the texts that preserve them sure aren’t. Another work was simply too long to be copied by hand, so it doesn’t exist anymore. Reality vs. ideal isn’t just the subject matter of these works, it’s behind the nature of their having survived for Adamson to write about. So this isn’t really a "history without any gaps," it’s just a history of what chance or fate have left to us. The real world that shaped these thinkers’ thought also shaped this book—and our own lives. And that’s precisely the point of their philosophy. So if you don’t have time to read this book but read another newspaper instead, or are on a deadline, or the baby is crying, these aren’t merely distractions from philosophy—they are the philosophy, the subject of what people who don’t have to feed the baby talk about in their spare time. Adamson points out that philosophy requires wealth—it’s a leisure time activity. But what it talks about is what the rest of us live every day. With Alexander dead, the big question became, how do you govern all these disparate peoples? 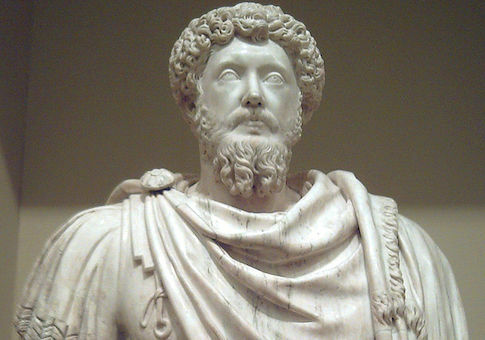 Under the Roman Empire the same questions persisted: what is the relationship between the self (say, the complex personality of a Marcus Aurelius) and the fact that each of us has a job to do? What of the tilt inwards of St. Augustine in the Confessions and then its application to reality—in his case, the sack of Rome—in the City of God? It’s so much more nitty-gritty than Plato’s ethereal ruminations on philosopher-kings contemplating Ideas in the Republic, and more anguished than the more serene Christian philosophy that followed. What emerges from the hundreds of pages of exposition, cutesy asides, and the barbs of a practiced lecturer trying to joke and jolt drifting students into paying attention, is a portrait of ourselves: we live in reality but constantly seek beyond. We don’t achieve it, necessarily, but we gesture towards it. That’s certainly the explicit message in the last two of the book’s three sections, where Neo-Platonism uses the images of an Ideal Reality beyond perception as a bridge to the Christian conviction that this Reality is the monotheistic God. Adamson is also clear that when and where you live determines what you think. Hellenistic philosophy, he says, was a time of physicalism. "It was as if," he says, "Alexander the Great had sent out a memo to all philosophers telling them that immaterial substances were not welcome." So thought doesn’t escape reality; it’s related to it. Modern academic philosophy, by contrast, has largely moved on to something like the period past the end of this book: hair-splitting medieval scholasticism. It’s largely devoted to how words mean. Philosophy professors these days, who style themselves "philosophers" (English professors like me don’t say we’re novelists unless we are), use words to focus on words. It seems too self-serving to be real, yet real it is, at least for the dwindling number of professors in an educational system where most students major in business and where teaching assistants lead most of the classes. Adamson makes clear that the history of philosophy is determined by fads and trends: if you’re alive at a certain time, or a member of a certain school, you’re going to think in a certain way. Academic philosophy in our day has a dogma too: it’s that words are real things. The worst action is to say something mean about someone. As kids we still chanted that "sticks and stones can break my bones, but words can never hurt me" but what we’ve grown up into is a world where "hate speech" is apparently the worst transgression, and where critical concepts in books can cause trauma and have to be prefaced with "trigger warnings." My most fundamental right is that others have to refer to me in words the way I want to be referred to. Words have become actions. Few of the thinkers brought so winningly back to life in Adamson’s book would agree that this is so, which is why it deserves to be read, bad puns and all. Nowadays the most interesting philosophy isn’t produced by people who call themselves philosophers, but in newspaper politics: income inequality? American isolationism? Social programs, yay or nay, and if so, which and how? This is the pragmatic philosophy of our day, debating the conflict between ideal and real. This is what echoes the thinkers in this book, who negotiated the transition of the world from Classical to Modern. They used thought to consider the world, not retreat from it. Even if you never read anything but the newspaper, you’re probably closer in spirit to these thinkers than today’s professional philosophers. Maybe reading nothing but the newspaper isn’t such a bad thing after all. Bruce Fleming has taught English at the U.S. Naval Academy since 1987; his books and articles are noted on his Web site www.brucefleming.net.